OSLO, Norway, October 11, 2013 (ENS) – The Nobel Peace Prize for 2013 goes to the Organization for the Prohibition of Chemical Weapons for its extensive efforts to eliminate chemical weapons. The honor comes as the OPCW oversees the destruction by Syria of its chemical weapons stockpiles with a deadline of mid-2014. The prize of 8 million Swedish krona (US$1.2 million) derives from the will of Swedish chemist, entrepreneur and pacifist, Alfred Nobel (1833-1896), the inventor of dynamite. Based in The Hague, The Netherlands, the Organization for the Prohibition of Chemical Weapons works to implement the 1997 Chemical Weapons Convention, acceded to by 189 governments. In September, Syria joined the convention, under pressure from the international community after chemical weapons attacks in several Damascus neighborhoods on August 21 that killed an estimated 1,429 people, including 426 children. Calling the ban on chemical weapons “an enduring and universal norm,” OPCW Director-General Ahmet Üzümcü, a Turkish diplomat, said today that he receives the recognition with humility. The global ban took effect in 1997 after a 100-year effort following the world’s first chemical weapons attack during World War I. 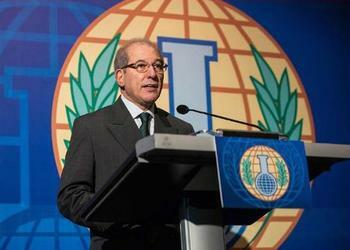 Today the work of the OPCW is more urgent than ever, the director-general said. Honoring the “expertise, professionalism and dedication of our staff – qualities that have been forged through a solid record of achievement,” Üzümcü said the organization’s work would not be possible “without the steadfast support and commitment” of the 189 States Parties to the convention. Since the Chemical Weapons Convention came into force, OPCW staff members have conducted more than 5,000 inspections at hundreds of chemical weapons-related sites and nearly 2,000 industrial plants in 86 member states around the world. Ban said that later today the UN Security Council is expected to approve a first-of-its-kind OPCW-UN Joint Mission in Syria following the landmark work carried out by the UN Chemical Weapons Investigation Mission.